A few days ago, I read an article on the Huffington Post about hydrokinetic energy as an up-and-coming sustainable energy source. The Federal Energy Regulatory Commission (FERC) has now officially issued the first commercial license for tidal power to a New York company – Verdant Power. After five years of testing, Verdant Power is ready to kick off a pilot project to provide energy to New York City homes through its turbines in the East River. By 2015, Verdant hopes to have 30 active turbines in the East River, which could produce 1 megawatt of electricity (or enough to power 9,500 homes). While Verdant is the first company to receive such a license, FERC has reported that 32 other companies have similar “ocean energy” projects in the works, and 69 projects plan to tap into the kinetic energy of flowing rivers. Ok, very fascinating. But, what exactly is hydrokinetic energy, and how does it work? Hyrdrokinetic energy uses the power of moving water (hydro=water, kinetic=movement) to create energy. Specifically, hydrokinetic power uses underwater turbines, which are spun by tidal movement. Oceans, canals, and rivers can all be sources of hydrokinetic energy. Hydrokinetic energy is a sub-category of hydropower, which includes dams, pumped storage, and conduit installations. Tidal hydropower and similar technologies are viewed as a huge opportunity right now. While they may generate less electricity than dams (see this chart – the largest dam in the world produces nearly 20,000 times the electricity of Verdant’s 30 turbines! ), these new technologies have been far less intrusive and damaging to the environment. Hydropower is indigenous: Not only is hydro a domestic energy source (yay energy security), but it is able to generate power throughout every region of the country. Currently, hydropower accounts for over 65% of renewable electricity generation in the United States (and 7% of our total electricity output). Hydropower doesn’t create pollution: this climate-friendly energy source doesn’t produce air pollution or toxic by-products. According to the NHA, “Using hydropower avoids nearly 200 million metric tons of carbon pollution in the U.S. each year – equal to the output of over 38 million passenger cars.” This means cleaner air and water. Bonus! Hydropower has the possibility to produce a growing portion of the electricity needed to power the United States: According to the U.S. Energy Information Administration (EIA), in 2010, the United States produced 4.12 TWh (terawatt hours) of electricity. According to the NHA, hydropower accounts for nearly 7% of that power (288 GWh per year) and has the potential to add an additional 60 GWh per year by 2025 (see: NHA-Presentation-2011) with the right policies in place. Even a small increase like that can mean a big change in the environment. Hydropower means additional jobs are created and kept here in America. Right now, hydropower employs 300,000 workers in the United States, but Navigant Consulting and the NHA have asserted that, “1.4 million cumulative jobs could be created by hydropower by 2025 when policies such as a renewable electricity standard are deployed.” With 12.8 million Americans currently unemployed (according to the Bureau of Labor Statistics), I’d say we’d take all the jobs we can get. That’s a reduction in unemployed Americans of nearly 11%! One major downside of conventional hydropower (namely, dams) has been its impact on local ecosystems. Dams disrupt the natural flow of rivers and often lead to flooding and the destruction of fish and other wildlife. According to American Rivers, dams can reduce water levels downstream of a dam, slow water flows, alter water temperature, decrease oxygen levels in the water, prevent silt and other nutrients from flowing downstream, and injure fish and other wildlife with their turbines – all of which throws the natural ecosystem out of equilibrium. 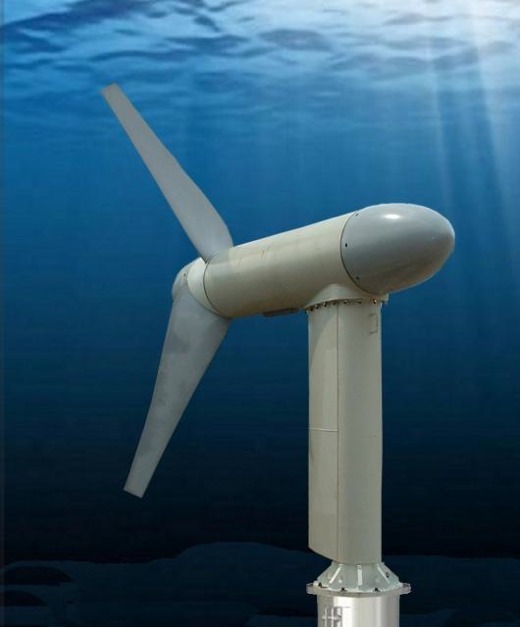 HOWEVER, marine and hydrokinetic power projects like Verdant’s underwater turbines are generating electricity with a much smaller impact on wildlife. In fact, Verdant says it hasn’t had a single fish casualty to date! I like that Verdant Power and others are working to develop new types of hydropower that are effective while having a minimal impact on the environment. I think it is especially important to keep research in green technology very diversified at this point in time. We don’t know yet which renewable source will be the one to surpass crude oil or coal. But, with continued testing and innovation by the green technology sector, we can absolutely change the current fuel landscape for both developed and developing nations worldwide. Thanks so much for reading; I’m glad you enjoyed the post!